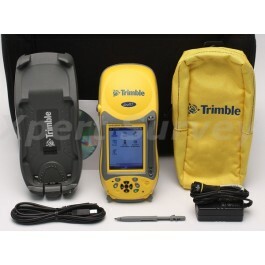 The Trimble® GeoXT™ handheld, from the GeoExplorer® 2008 series, is the essential tool for maintaining your GIS. A high performance, submeter GPS receiver combined with a rugged handheld computer, the GeoXT handheld is ideal for use by utility companies, local government organizations, federal agencies, or anyone managing assets or mapping critical infrastructure who needs accurate data to do the job right—the first time. And if you need that extra edge in precision, you can collect data with Trimble TerraSync™ software or the Trimble GPScorrect™ extension for ESRI ArcPad software, and then postprocess it back in the office. The GeoXT handheld is powered by the industry-standard Windows Mobile® version 6 operating system so you can choose a software solution designed for your field requirements, whether off-the-shelf or purpose-built. includes familiar Microsoft® software, including Word Mobile, Excel Mobile, and Outlook® Mobile, giving you all the tools you need for a seamless exchange of data between the field and the office. With the GeoXT handheld you have the flexibility to work exactly the way you want to. Do you need to access the Internet or your organization’s secure network to get the most up-to-date data? No problem— with the GeoXT handheld you have built-in wireless LAN and Bluetooth technology to ensure you stay connected. Accurate information is crucial to making informed decisions and improving the way you do business. The GeoXT handheld delivers consistent submeter accuracy both real-time and postprocessed, so you know your GIS has the information that others can depend on to do the job right—this time, next time and every time.